I've seen these around before but never tried it because I didn't realize how useful and interesting an exercise it would be. 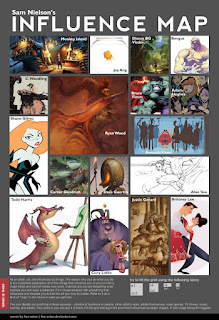 I agonized over who to leave out, and I still wonder if I should have included artists such as Dave McClellan, Joe Olson, Erwin Madrid, Marcelo Vignali, Paul Lasaine, and Paul Felix. Those artists deserve credit in my development but I just ran out of space. The most interesting part of doing this was realizing how many good artists I'm NOT influenced by. There are mobs of artists who I've thought for a long time are amazing, yet they have not in any way changed the way that I work or think. This is a really strange thing that I don't understand. And yeah, I know Bengus isn't an artist but a group of artists. More than one of them influenced me, so I'm including them as a group. I have to mention that the UDON selection is incorrectly showing official art by one of Capcom's legendary illustrators (I believe the artist is Bengus? )who does not belong to UDON. I think the confusion might be because UDON tend to publish the Japanese Capcom art books in the west and produce comics using the Street Fighter license. I need to check out some of the other names on that map! Keep up the good work, Sam. Nice! I love these Influence Map things. Good source to discover other great artists. Shoki: Good catch, fixed it! I actually meant Bengus but couldn't remember the name and UDON was the first thing that came to mind. Very neat! Awesome map - I love seeing what inspires/drives others. I noticed that same thing when I did my own map a few weeks ago - that there are so many artists I do admire immensely, but they haven't stuck with me/influenced me. It's interesting, to say the least! I honestly think that the influence thing has something to do with our peculiar chemical/electrical sets. Like one tone may harmonize with another, but set up phase cancellation with still another. All the tones are great, but some fit and some don't. Attraction. Attraction doesn't define appreciation. You're gonna laugh, but I think Pinterest (heaven help us) is actually more or less this kind of map. My daughter made me join the thing by telling me it's like keeping a corkboarded collection of clip art. And when I look at the stuff, the fluffy felt deer, etc - I realize that something about each thing influences my vision of - maybe even myself somehow. Anyway - prosaic, but there you are. wow. this is so good, man. If the printer got it any better it must have been with magic. I didnt learn enough from alan tew but he definitely was one of my first real favorites. Its like I have the words "beeba dot net" build into my phsyche.